Like most kids I know, my children love to create art. But I’m not confident in my artistic abilities, so I take my children to art activities at the local library or sign them up for art classes in the area. However, sometimes our schedule is full and our budget doesn’t have room for an additional course. When that happens, what can a homeschool mom do? Enter YouTube! I regularly turn to YouTube to find instructional art videos I can use with my elementary age children. There are many great channels on YouTube, but one of my favorite channels is maintained by an art teacher named Mr. P. His YouTube channel, Mr P Studios, is fabulous! My kids enjoy Mr. P because he’s entertaining and funny, but I enjoy him because he creates gorgeous art projects I can easily recreate here in our homeschool. I also love Mr. P’s channel because I think it is important for Black homeschoolers to see instructors that look like them. 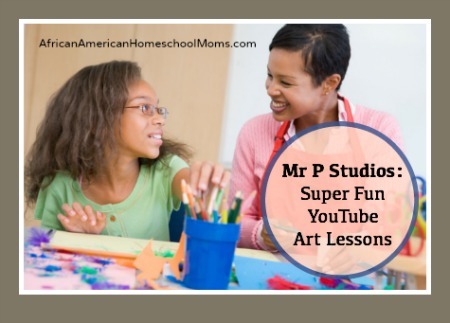 If you’re looking for some fun and easy to recreate art projects you can add to your homeschool, I encourage you to stop by Mr P Studios. Take a sneak peek at his channel by viewing this awesome lesson on African Pottery Drawing. Yes, he is! We love his humor and the fact that he’s helped us create a beautiful at home wall art gallery. Definitely a channel worth subscribing to. My kids attend the school where Mr. P teaches and he and his wife are both amazing teachers! They do things in the community as well as the school. I am so thankful to have them in our community!